Brown the beef in a skillet. Drain the grease and stir in the onions, garlic and spices. Cook on medium/low heat until the onions soften and become transparent. Stir in the remaining ingredients and dump into a large casserole dish or deep 13×9 lasagna pan. Cover with aluminum foil. Bake in a 350F preheated oven for 90 minutes. Halfway through the cooking time, take the casserole out of the oven and give it a stir. 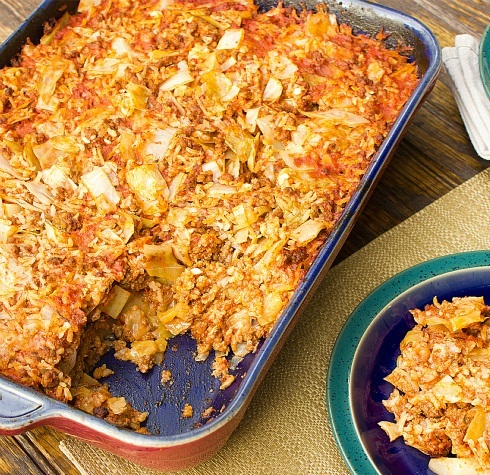 If you prefer to have the cabbage soft and the rice very tender, similar to cabbage rolls, add another ¼ cup of water after the 90 minutes and cook for another 30 minutes.